"Boston has also become more cosmopolitan. When I grew up here, I felt there was a distinct town-gown divide. That has shifted a bit. I think that it is once again recognizing itself as a city of many different kinds of people and a city of immigrants." the notion that freedom depends on these. In addition to her responsibilities as Laureate, she teaches in the Creative Arts in Learning Division of Lesley University in Cambridge. Reporter Jaime Kaiser stopped by her office at Lesley to talk with Legros Georges about her art and her mission to help grow poetically-minded communities. Kaiser: What do you see as your role as Boston’s poet Laureate, within the community? Georges: My role is to serve as an advocate for poetry, language and the arts in the city. The role involves raising the status of poetry in the consciousness of Bostonians, serving as a poetry ambassador. How I do that is by participating in civic events, by presenting poetry in a variety of venues for a variety of moments. Most recently, there was the opening of the Boston Public Library, a renovation of the Johnson Building and so now we have a beautiful new library, in essence. Kaiser: You mean the library in Copley Square? Georges: In Copley Square. Yes, with all kinds of news spaces, and with wonderful technology making things much more accessible. There was the opening with the Mayor and the President of the Boston Public Library and various dignitaries and I was asked to create a poem to celebrate that moment. And I was happy to do so as Poet Laureate, to write what’s called an occasional poem – especially since the last person who wrote such a poem for The Boston Public Library was Oliver Wendell Holmes in 1888. Now, I figure, if I’m following in the footsteps of Oliver Wendell Holmes that’s not too bad. I also create programming that supports the idea of getting poetry out there to people who may be unfamiliar with poetry. To create a feeling of the value of poetry and also amplifying the great poetry work that is already taking place here in Boston. We’re a very literary town and there’s been a wonderful emphasis recently by City Hall and Mayor Walsh to make Boston a municipal arts leader. And I think that’s happening, in part, because there’s been the appointment of Julie Burros as the Chief of Arts and Culture here in Boston, who sits on the Mayor's cabinet. The Poet Laureate position resides in the Mayor's Office of Arts and Culture. I see part of my function as being present for poetry, and getting to know and connecting to the various poetry communities here. There’s not just one poetry community or one literary community. There are the spoken-word-artists, the performance artists, and the community artists, poets connected to the academy, MFA students, people who write poetry but might not consider themselves poets, readers and so on. In fact, there’s one group of artists called the Carpenter Poets. These poets are carpenters who when working on buildings have a lot of time to think. While they’re working, they compose poetry and, recently, they created an anthology of carpentry poetry. It is delightful. Amplifying this work is something that I can do as Poet Laureate. Kaiser: The role you have in the community is very unique. I have to assume that you didn’t grow up wanting to be a poet laureate ­– the poet laureate of Boston – Is that true and how did this role come about? Georges: The Poet Laureate is an honorary position. Most laureates receive their laurels for some sort of achievement. I’ve been writing poetry for many, many years – more than 20 years – and studied poetry as a graduate student and loved poetry. I was not really thinking about becoming the Poet Laureate and I’m only the second Poet Laureate of the City of Boston. The first poet Laureate is Sam Cornish. Our city's laureate position was established in 2007, and I sat on the committee to appoint the first poet laureate. He was someone we thought hadn’t received the recognition he deserved at the time we appointed him and he’s a wonderful poet. I appreciated being able to play a role in support of our first laureate. I’d been shortlisted for the first poet laureate position, but I thought ‘no, I prefer to be in the background’ and to honor someone like Sam. Kaiser: Is that your way about other things, in general? Kaiser: So you have to talk someone every once in a while? Georges: [Laughs] Exactly. The call for the second poet laureate came around and it didn’t occur to me to apply. Not because I didn’t think I understood the value of the role but I thought, ‘I’ll let someone else do it.’ A friend of mine and a literary colleague came to me and said, ‘you should do this’ and I thought, ‘okay, I’ll think about it.’ I didn’t apply and he came back around and said, ‘you really, really ought to apply.’ And so, I submitted a small proposal. In December 2014, I received a call informing me that I’d been appointed Poet Laureate. It was a wonderful surprise – I didn’t know exactly what was in store for me this go round, but I knew the role involved facing the public. Kaiser: Were you nervous about that part? Is that what discouraged you from applying? Georges: I thought of myself less as a public figure than not. This is a quasi-public role, but I have loved it. I have ended up really loving the role. I can’t think of something more interesting to me than talking to people and creating programs about something I really love. It didn’t occur to me that it would give me this really lovely platform on which to address people about poetry and issues, you know, current issues, history, and culture. You know, poetry allows for everything that art carries so it becomes this really excellent vehicle for the exchange of ideas. Kaiser: And how did you find poetry when you were younger? Georges: I started writing poems as a teenager, though I started writing long-form, essays, much earlier. I’m Haitian, originally, but I grew up in Boston. I submitted that essay on Harriet Tubman to a contest way back in the day. It came as a complete surprise and it also made me understand that my words could go out into the world and have value. I had excellent teachers most of my life. Later, I took a wonderful course in African-American Poetry in college and was hooked and then joined a group of young black writers called The Dark Room Collective. We were all writing and reading and learning from one another, and educating ourselves. Kaiser: What do you think public art can achieve that art in a museum or poetry in a book can’t? Do you think there’s a difference? Georges: That’s a great question. One thing that compels me about public art is that it’s meant for everyone and it’s accessible to everyone. It can engender discussion between people who might not ordinarily be together. It’s meant for the consumption of the everyday person who is walking through her neighborhood or walking through his streets. Kaiser: What are some of the themes that your own poetry deals with? Georges: I have two books. The first, Maroon, was published in 2001, and the second, The Dear Remote Nearness of You, was recently published. In Maroon, I explore identity a great deal. I was contending with two very different cultures, sometimes with very contradictory values. I was looking at Haitian-American identity, diaspora identity, black identity, and all the sort of subculture within those larger cultures. I was making sense of that experience. And so writing helped me do that. Writing was, and still is, a space of inquiry for me. It’s a space in which I get to explore questions. I’ve always been interested in issues of social justice and grapple with these through with my work. 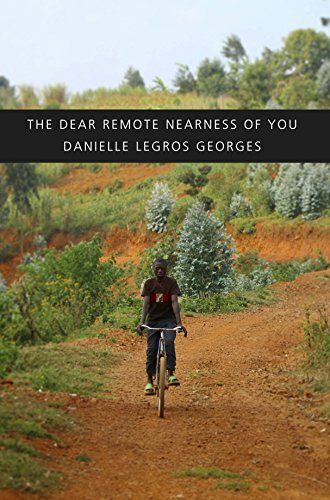 My most recent book – The Dear Remote Nearness of You – has to do with the idea of being near and far at the same time. I was thinking, for example about the virtual world and the real world. How we can be experiencing something across the world from us through technology? The idea of having left a country and having moved to another country and feeling ideologically and philosophically close to your country of origin, and yet being in a new country. Kaiser: What do you think factors into the success or failure of an idea? Georges: I think the most compelling ideas for me come from the marriage of seemingly disparate notions. Two things that aren’t supposed to go together somehow going together, you know, just as long as they’re not producing devastating effects. For example, the atomic bomb was a great idea in science but when applied to humans, not such a great idea. Why that idea? For what reason? Is it really important in the world of ideas? In art, clashes and mixes are what produce the most compelling work for me. Kaiser: Have you seen the city change a lot since you were a kid living here? Georges: Absolutely, absolutely. I grew up in the 70s and 80s in Boston and that period was a very difficult one for the city. Boston bussing was taking place between 1974 and 1980, and so there was a great deal of racial tension in the city that we don’t see as much of now. I’m not suggesting that all our problems as a city, and certainly as a nation, are solved relative to race. But I think city council and city leaders have worked really hard to be aware and to address those tensions. Boston has also become more cosmopolitan. When I grew up here, I felt there was a distinct town-gown divide and I think that has shifted a bit. Boston has always been an international city , since its birth. I think that it is once again recognizing that it’s a city of many different kinds of people and a city of immigrants. In fact, in spite of what some politicians might want you to believe, this whole country is a nation of immigrants. Boston is beginning to feel like a more inclusive place to me. Kaiser: Do you think poetry really has the power to relieve racial tensions or clashes? And what do you see as the primary role of poetry? Because I know people have different opinions in that some people think art should affect political change and other people think art is something that’s very apolitical. Georges: Poetry is an art form through which we can tell all kinds of stories and make all kinds of statements: political statements, more personal statements and it’s also a form of art that is not expensive to produce. If you have a thought and you have an idea about how to craft a poem, you can make a poem. As a result, I would say it’s one of the most democratic forms of art. Almost anyone who has access to language and some writing implement can make a poem, which he or she can share with someone else. It is often designed for a one-to-one dialogue between the creator and the reader, and readers can be many. Here it maintains a great broadcasting power. It can come from all kinds of individuals and communities. While some poetry can be seen as decorative, or be concerned purely with aesthetic concerns, poetry can also be and has served as a tool of education and against oppression, for example, in what’s called engaged poetry or poetry of witness. It can also be a tool we use in response to violence. I think a great part of its value for me is that it can be produced by just about anyone truly interested in it, and read by anyone interested in art, ideas, and freedom and exchange. Georges will be performing September 24th at The Meeting House at The Old Manse from 2-4 as part of a larger Public Art Initiative curated by Pedro Alonzo for The Trustees of Reservations. Georges has been teaching in Lesley University's Creative Arts in Learning Division since 2001. Her recent literary awards include the 2015 Brother Thomas Fellowship, the 2014 Massachusetts Cultural Council Artist Fellowship in Poetry, the 2012 Massachusetts Cultural Council Finalist in Poetry, Lesley University Faculty Development Grants, and a 2013 Black Metropolis Research Consortium Fellowship/Andrew W. Mellon Grant.